1. Whisk yolks and sugar till well combine. Add in vegetable oil and water. Mix well. 2. Sift in the flour and cocoa powder. Whisk to combine. 3. Mix sugar and cornflour in a small bowl. Set aside. 4. In another bowl beat the whites till foamy. Add in ½ portion of the sugar cornflour mixture and vinegar. Beat till glossy. Add in the rest of sugar mixture. Continue beat till stiff form. 5. Spoon 1/3 of the stiff whites into yolks batter. Fold to combine. Pour the yolk mixture into the remaining whites bowl. Fold till well combine. 6. Pour into 8-inch round pan with removable bottom (do not line with paper and do not use non-stick pan). Bake at 130C for 35 minutes. Increase the temperature to 150C and bake further 25 minutes. 7. Once cooked remove from oven. Immediately invert and leave to cool. When cake is cool, remove from mould. Divide the cake into 2 layers and is ready to be used. 1. In a mixing bowl, whip the dairy cream until peak form (not too stiff) and keep inside fridge for later used. 2. With double boiler method, melt the chocolate. Set aside to cool slightly. 1. Place the 1st layer of chocolate sponge cake inside the prepared pan. Pour one portion of mousse on top. 2. Place 2nd layer of cake and gently press to secure with the mousse layer. Pour remaining mousse on top. 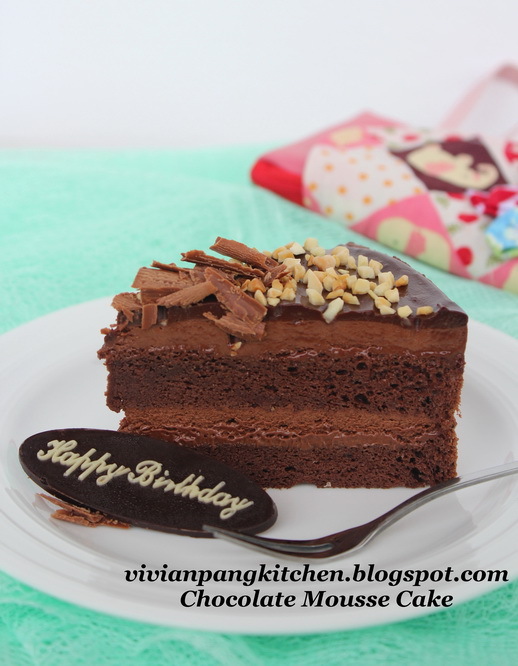 Keep the cake inside fridge at least 4 hours or overnight to set. 1. Add dairy cream and chocolate into a heat proof bowl. With double boiler method, melt the chocolate. Once most of the chocolate melted remove from heat and continue stir till form smooth paste. Set aside. 2. 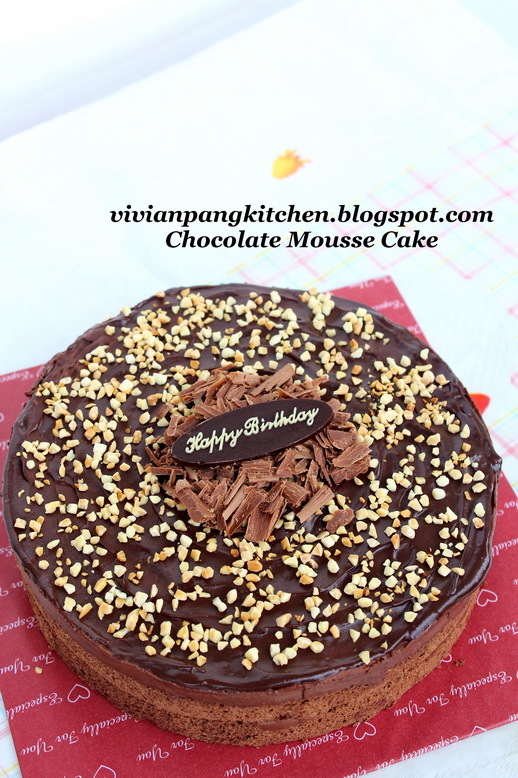 Remove the mousse cake from pan (Part II). Pour the top with chocolate ganache. Keep in fridge to set (about an hour). Decorate with shredded chocolate and almond nibs on top. Enjoy! Thanks for sharing your secret recipes. My kids would this! I'm pretty sure!